VOTE ‘NO’ on the COMPACT FOR AMERICA | No Convention of States! 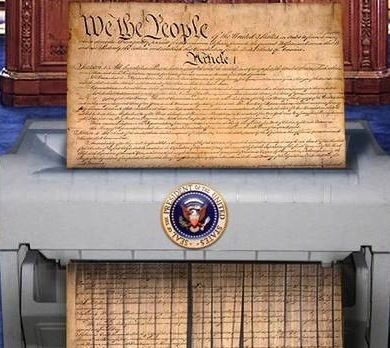 HERE IS THE INSIDE STORY THE COMPACT FOR AMERICA DOES NOT WANT YOU TO READ! We are aware of several organizations that are contacting all state legislators in the nation to promote bills or resolutions petitioning Congress to convene a Constitutional Convention using the Compact For America Initiative Interstate Compact. In Arizona this bill is HB 2328. The Compact for America Initiative acclaimed safeguards are totally inadequate to prevent bad things from happening to a good Constitution. This noble attempt to restrain unconstitutional federal spending has a number of serious problems. THIS COMPACT DOES NOT PASS CRITICAL REVIEW and so is not worth the paper it’s printed on. (2) pre-ratify a specific BBA so that it would not be necessary to get 38 states to ratify a BBA after it would be proposed by the amendments convention. Although Article V of the Constitution certainly provides for the calling of constitutional conventions for the People to exercise their right to alter their government, over the past 30 years or so most state legislators have voted against enabling such open conventions to be held, believing that the risk to the Constitution posed by such open conventions outweighs any possible benefits from one or a few specific amendments. 1. Only an Amendments or Article 5 Convention ITSELF CAN LEGALLY MAKE ITS OWN RULES-not an Interstate Compact, according to the U.S. Constitution Article V.
2. What part of NO does Congress understand and respect? NONE. NADA. If Congress willfully ignores the authority of the U.S. Constitution now, why would we expect it to obey the Constitution when amended? This bill is smoke and mirrors and its proponents refuse to answer this question BECAUSE THEY CAN’T! 3. The Compact for America Initiative would pose an unacceptably high risk of damage to the Constitution; it opens the doors to all manner of unseen attempts to hijack, disrupt and redirect convention proceedings with a high possibility of language weakening its structure or even totally revising the Constitution completely! a. Example: the GOP Tampa, Florida convention rule changes forced through during the convention to defeat particular delegates’ proposals. c. A NEW CONSTITUTION was already devised in 1970 by the Center for the Study of Democratic Institutions and funded by the Ford Foundation! d. A radical technique used to disrupt political proceedings is to organize mobs well in advance to activate civil unrest at key times when pressure is needed on decision makers. This was used by Soros-funded groups in the Ukraine to destabilize elections and also used in our 2012 Arizona Presidential Preference election and documented here. The presentation was so sensitive that was removed, so is posted here. 4. In the HB2328 Overview Provision 2.c. states, “a state may only withdrawal by unanimous consent of the member states.” violates Arizona’s state sovereignty; opening the Compact/Convention to expensive litigation. 5. In the HB2328 Overview Provision 3.b.v. states, “Oversee the defense and enforcement of the compact in appropriate legal venues” and in 8.h. “Directs each member state’s chief law enforcement officer to defend the compact from any legal challenge” means legal challenges are fully expected but can be made only in a Texas court that could hamstring the process for a long time and require substantial legal fees which Arizona cannot afford. 6. It contractually forces Arizona to fund and otherwise support other agencies, lobbyists, or groups without constraint or legislative oversight. 7. In the HB2328 Overview Provision 3.d. states, “Prohibits the commission from taking any action that contravenes or is inconsistent with the compact” PROHIBITS withdrawing for NEW DISCOVERY of facts with which the State of Arizona may disagree, or be placed at disadvantage. 8. Creates an indefinite commission that will last until long after its purpose is accomplished since THERE IS NO SUNSET CLAUSE. We don’t need another creature to wrestle to death when its supposedly finite purpose is achieved. 9. This is the same well known Balanced Budget Amendment movement periodically reappearing over the last three decades that has already been debunked many times over. 11. Here’s the obvious–what makes anyone think a BBA will restrain spending? A BBA WILL REQUIRE MASSIVE TAX INCREASES. States are already almost broke and WILL NOT mandate federal reductions because federal monies are states’ livelihood! Finding 26 states to approve federal spending on monies for the states WILL BE ALL TOO EASY. 12. Congress has authority to RAISE TAXES in spite of a BBA. 13. The State of Hawaii issued a convention call in 2011; Congress is REQUIRED to include Hawaii’s and any other state’s call in any convention that Congress convenes, including Hawaii’s call to remove the existing 2nd Amendment recognizing the right to bear arms and replace it with ‘Obamacare’. Do we really want to chance of this happening when all the cost and tremendous effort going into developing the Compact For America may create the temptation to compromise instead of dissolving it? 32 states already have calls to Congress for various topics. 14. MANY states INCLUDING ARIZONA have ALREADY RESCINDED previous calls for just such a convention and for GOOD REASONS, many noted herein; let’s not have to rescind this all over again. Binding against rescission already places Arizona at disadvantage. 15. Furthermore, during the last 25 years the following states have passed resolutions rescinding all of their previous constitutional convention calls: Ala., Ariz., Ga., Idaho, Mont., N.D., N.H., Okla., Ore., S.C., Tenn., Va., Utah, and Wyo. b. Since the Constitution went into effect, there have been about 400 petitions from state legislatures calling for a convention to consider one thing or another. None of these efforts ever succeeded. 16. Billionaire George Soros has VOWED to replace the U.S. Constitution by year 2020 and is in a position to take advantage of a convention to do so. While condemning what it calls “judicial activism” by conservative judges, the Soros funded American Constitution Society for Law and Policy (ACS) in fact encourages judicial activism by the left. c. In 2005 the American Constitution Society (ACS) Yale University chapter sponsored a conference at Yale Law School titled “The Constitution in 2020,” to give liberal/left lawyers and judges a forum wherein they could trade ideas on what they would like the U.S. Constitution to look like 15 years down the road, and how they could influence it toward that end. d. The stated purpose of the conference, at which some of America’s best-known liberal law professors appeared, was to work toward a “progressive” consensus as to what the Constitution should provide for by the year 2020, and a strategy for how liberal lawyers and judges might bring such a constitutional regime into being. e. Through its “International Law and the Constitution” working group, the Soros funded ACS disparages American law as antiquated and inequitable, and calls on judges to make American jurisprudence subservient to United Nations treaties and European Court of Human Rights decisions. Co-chairing this group are Jamil Dakwar, a former Human Rights Watch staffer who currently directs the ACLU’s Human Rights Program; Catherine Powell, a Board member of Human Rights Watch; and Cindy Soohoo, Director of the Center for Reproductive Rights’ Domestic Legal Program. With an eye toward cultivating ever-new generations of leftists in the future, ACS has developed a “Constitution in the Classroom” program whereby volunteers, under the banner of “education,” indoctrinate young students across the United States. 17. The ratification process originally required 100% of the states to ratify amendments, now it is set to 75%. This weakening precedent exists and holds weight in future conventions. 18. If the DIRE CONSEQUENCES of voting FOR this Compact/Convention finally materialize, they will taint a legislator’s political reputation beyond recovery. A TOTAL of $6 TRILLION over the last 10 years or 600 Billion per year! Except for declared war in defense of the states, THESE ARE STATE ISSUES TO BE CONSTITUTIONALLY ADMINISTERED BY STATES, not the federal government. 21. FINALLY, A BBA IS NOT NECESSARY; it spurns the very Constitution the states already ratified: states ALREADY possess the power to prevent federal excess and usurpation. States did NOT cede their sovereignty to the federal government. In fact, the continuation of our Constitution and our Republic requires states to assert themselves and to reject any act of Congress that goes beyond the very narrow scope of authority granted to it by the states in the first place, in the Constitution we already have. This is called NULLIFICATION and RECALLING ELECTED REPRESENTATIVES who vote UNCONSTITUTIONALLY; this is the Rightful Remedy to unfettered Congressional spending; state legislatures need to ENFORCE THE CONSTITUTION, NOT AMEND IT. We are very concerned that such a convention could lead to proposing one or more amendments that could have a very harmful effect on our freedoms under the U.S. Constitution. Please vote ‘NO’ on HB2328 to call a national constitutional convention using the Compact For America Interstate Compact for a Balanced Budget Amendment. How the Compact for America Threatens the Constitution PDFexplaining the arguments against passing the Compact for America legislative package. Beware of Article V This 36-minute video to state legislators helps understand the negative aspects of convening a constitutional convention.